Carrots are available in the grocery store year round, it is hard to imagine that there is a carrot season. There is, and it is now. It's like a carrot Celtic knot! 3 intertwined carrots all wrapped around each other. 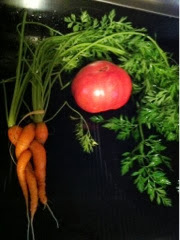 One carrot from above ground looked a bit on an angle, but we never expected this! 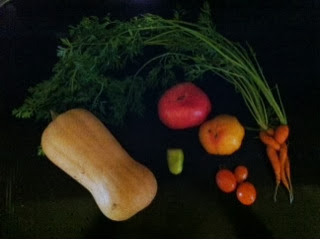 And for good measure, another photo with other vegetable friends.